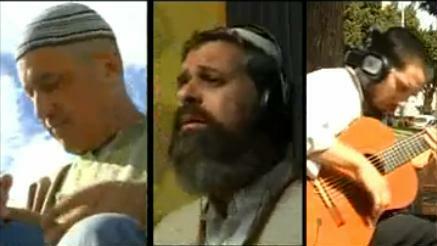 Jewish Humor Central: Welcoming Shabbat With Beautiful Melodies - "Eishet Chayil"
Welcoming Shabbat With Beautiful Melodies - "Eishet Chayil"
The Shabbat Song Project is an Israeli effort to spread the light of Shabbat, with popular singers performing traditional Shabbat melodies with new and eclectic arrangements. The arrangers and singers deserve a lot of credit for their creativity and use of a wide range of instruments and musical styles to present in a new light songs that we usually hear only inside a synagogue. In March we started the series, and shared renditions of Yedid Nefesh and Lecha Dodi, both integral parts of the Kabbalat Shabbat (Welcoming Shabbat) service. Today we're posting their music video of Eishet Chayil (A Woman of Valor), a hymn which is not sung in the synagogue, but in many homes after singing Shalom Aleichem and before saying the Kiddush. Traditionally, a husband sings the song to his wife, extolling her virtues, and expressing thanks for all that his wife has done for him and their family. The transliterated Hebrew text and English translation appear below the video. I feel it in my KISHKAS! Thank-you------love LOVE-it! And SHABBAT SHALOM! M.A.